COLORADO SPRINGS, CO. -- I'm here in Colorado Springs on a commercial assignment. 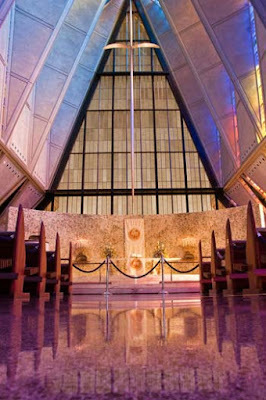 Yesterday I had the chance to visit the US Air Force Cadet Chapel again. I was looking for a different way to shoot a subject I've shot many times before. Remembering a time-tested formula, I just dropped to the floor and shot from an ant's perspective. All my other past images were from standard eye height. Literally putting my camera on the floor gave me a couple advantages. First, having it rest right on the floor eliminated the need for a tripod. I was able to brace the body on the floor. I clenched a fist and held the lense tight against it to elevate the front of the camera just slightly. Having a steady platform is essential for getting sharp images in low light situations and believe me, this was low light. Secondly, I gained a great reflective image in the foreground by being so close to the floor. I obviously lost some height by aiming lower, but I consider this a worthwhile tradeoff. In most any situation, you'll be surprised by the interesting new perspective of shooting from ground level. Give it a try.